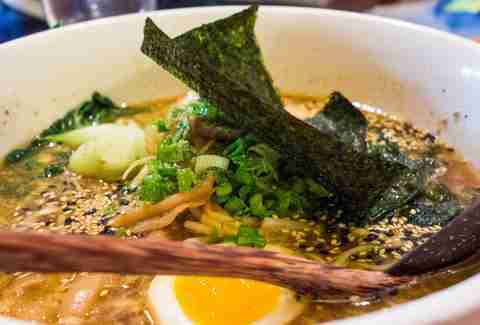 Montreal has a lot of restaurants, and in those restaurants are a lot of menus, and on those menus are a lot of dishes -- so tracking down the finest individual dozen is not exactly an easy task. But we eat not-easy tasks for breakfast... and lunch, and dinner, and came up with this list. Don’t get us wrong, there is an abundance of good taco places in Montreal (Maïs makes inventive ones with zucchini blossoms and pumpkin seeds; Else’s does a great Venezuelan one, etc. 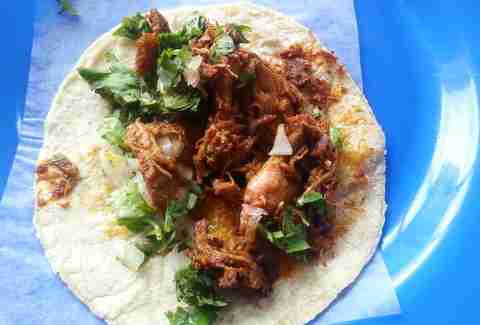 ), but for a truly authentic taqueria experience, you would be well advised to head down to Maria Bonita, and order its show-stopper; the traditional marinated pork tacos. 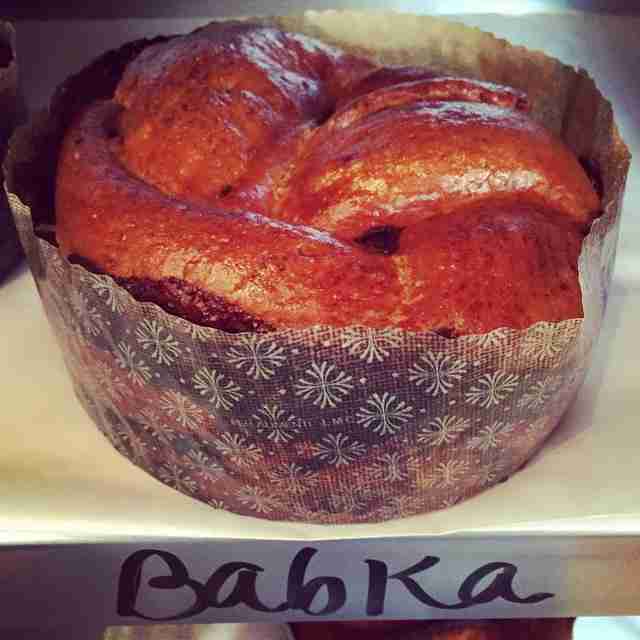 You just can’t go wrong with the chocolate babka at Hof Kelsten. Or the maple one. Or, in a pinch, even just a slice of its challah bread with butter, cinnamon, and brown sugar sprinkled on top, folded in on itself -- once you try it, there is no limit to what you will do to recreate the taste of it. 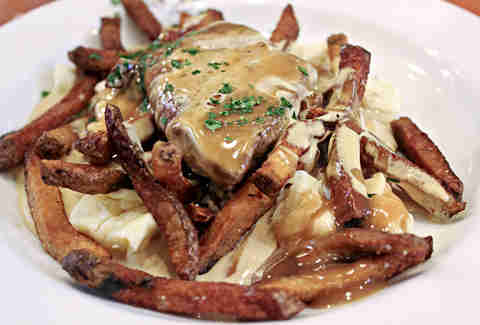 In a city that takes its poutine very seriously, Au Pied de Cochon’s Poutine au Fois Gras makes the list for being an in-your-face celebration of riches and excess. It's crisp potatoes fried in duck fat, topped with fresh cheese curds, foie, and a gravy made with more foie, egg yolks, and cream -- you will be sleeping soundly after this baby. 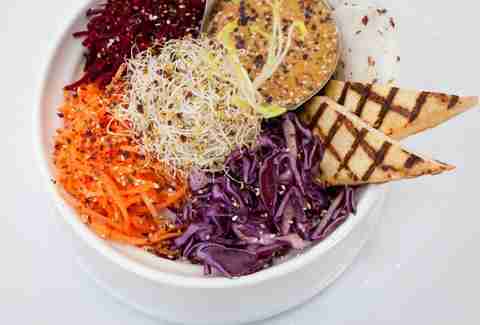 For a city that is known for its smoked meat and foie gras-laden poutine, Montreal has a surprising amount of vegetarian and vegan restaurants. But no single dish makes as much of an impression on vegan and non-vegan diners alike as the Dragon Bowl at Aux Vivres. Whether you’re in the market for a filling, but healthy meal, or if you’re looking to impress a health-conscious date, go to Aux Vivres, order the Dragon Bowl, and prepare to be impressed. If you had asked someone a year ago where one could find the best falafel in Montreal, the The Green Panther would have been the immediate answer. 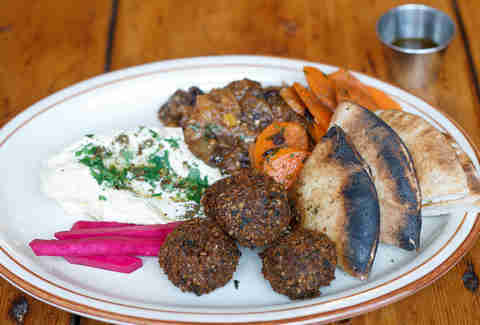 But with newcomer Sumac at the scene, the Middle Eastern game in Montreal has been taken to an entirely new level. With crisp falafel balls, perfect turnip pickles, some of the most luscious hummus this side of the Atlantic, and incredible fries (that almost deserve their own entry), there's a new falafel sheriff in town. 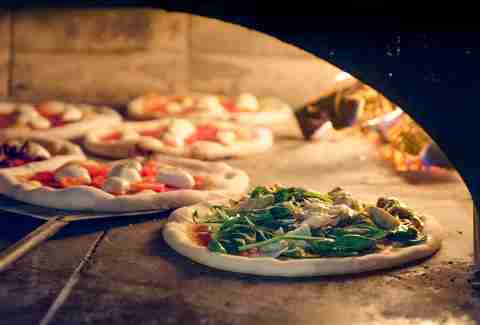 With a constantly rotating set of specials and brunch pizzas that will make your heart palpitate, this rustic pizzeria churns out incredible, wood-oven-churned pies that will make Italy proud. But the Prosciutto pizza, with its perfect balance of salty dry-cured ham, sweet cherry tomatoes, creamy bocconcini, and a crown of biting roquette is a definite crowd favourite. 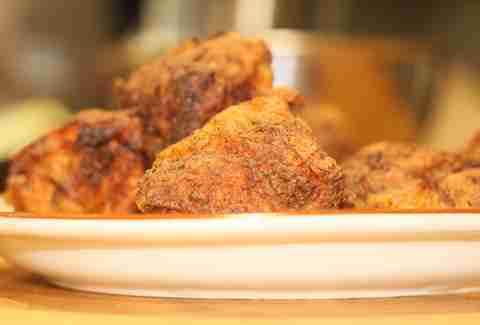 With a perfectly crackling outer shell and a taste that was born to be paired up with the house-made gravy, this dish brings a remarkably authentic Southern taste to the frigid Northern reaches of Quebec. Vaunted as one of the top restaurants in all of Canada, Park restaurant is where Chef Antonio Park comes up with some of the most inventive and beautiful sushi rolls in the city/country. 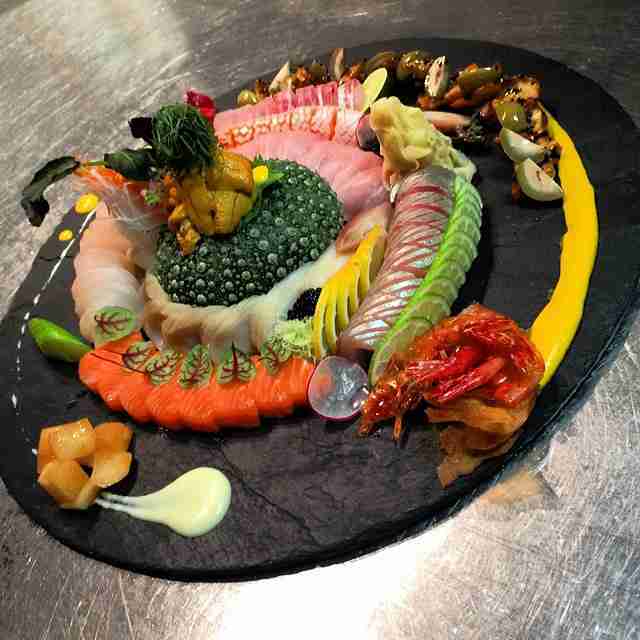 Pairing up Japanese and Argentinian flavours as a homage to his heritage, he is the only one in the country to serve Kaimin Tai fish, or fish killed humanely through the acupuncture method. But most people just come here for the fresh ingredients, beautiful presentation, and cool garnishes. Believe us, we wanted to present you with an option other than Schwartz’s. If we had spoken even two months ago, we would have gladly extolled the virtues of the Main, another Jewish-style deli just across the street from Schwartz’s. But then its owners sold, and the place no longer smokes its own meat. And other places just don’t measure up. 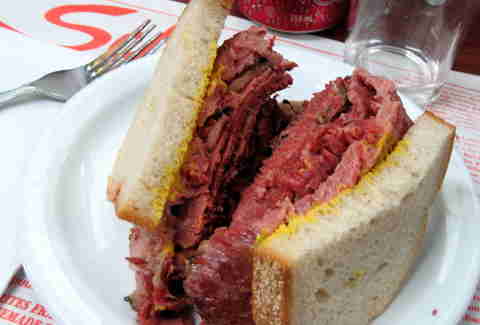 So, we will be the 10,000th source to tell you: you just gotta taste the smoked meat sandwich at Schwartz’s. It really is THAT good. Just don’t forget the Cott Black Cherry soda. 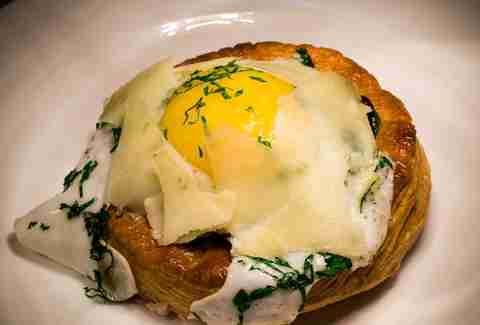 There is a strong disagreement in certain households whether the best item on Lawrence’s brunch menu is the sausage and egg roll, or the ham, cheese, and fried egg on toast. But we are going to go with the classic here and tell you that for the best roll, the perfectly cooked egg, and the most humanely raised and butchered sausage in Montreal, you need to queue up at Lawrence on a weekend morning. 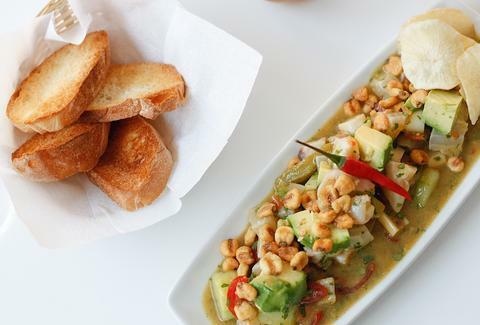 Though some people will swear that the best ceviche is Peruvian, the likelihood is that they simply haven’t tried the Venezuelan ceviche at its namesake restaurant. 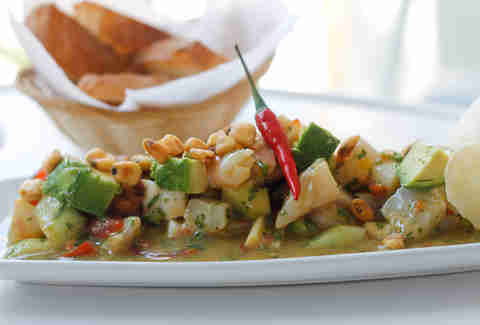 Spiked with lime, lemon, chili and the fruit flavours of your choice, this marinated seafood dish features plump, choice morsels of fish, octopus, and shrimp. And you even get to choose your own toppings! There is a consistent line outside of Kazu’s doors, and for good reason; this Japanese izakaya does all of the traditional dishes well, while also throwing in a few craftily executed modernized offerings, the standout of which is its perfectly salty lunchtime ramen (though if you miss that, the Japanese bibimbap bowl is also excellent).